FRISCO, Texas (Sept. 5, 2018) - Former Frisco RoughRiders pitcher C.D. 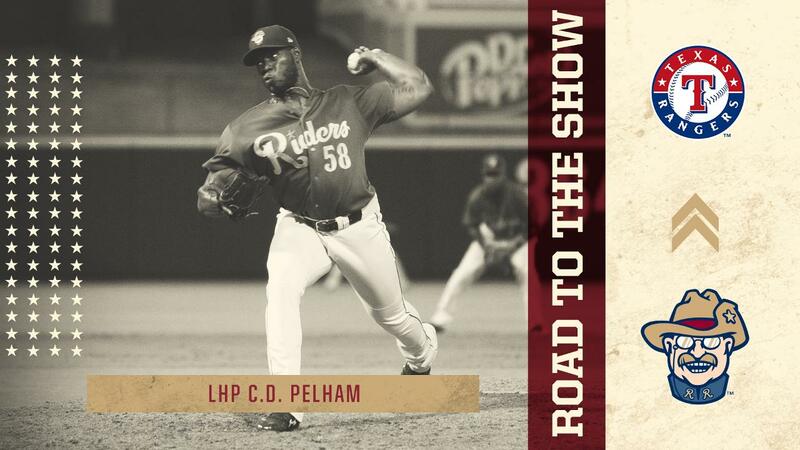 Pelham made his Major League debut with the Texas Rangers Wednesday night, becoming the 148th Riders player to debut in the big leagues. Pelham worked 2/3 innings in his debut, allowing a run on four hits. The southpaw joined the Riders, the Double-A affiliate of the Rangers, June 22 and went 2-0 with a 6.16 ERA in 24 outings, converting both of his save opportunities along the way. He joined the Riders after starting the year with Advanced-A Down East, where he was a Carolina League Midseason All-Star. Additionally, he was selected to participate in the 2018 Sirius XM All-Star Futures Game at Nationals Park in Washington, DC. Pelham had his contract purchased by the Rangers Tuesday following the conclusion of the RoughRiders season. He is the eighth former Riders player to make his Major League debut this season and the seventh to do so with the Rangers. For more information on the RoughRiders, visit RidersBaseball.com.